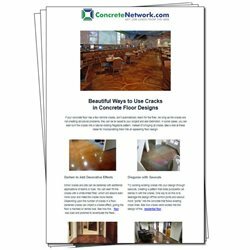 The Concrete Network's free newsletters give you news, how-to tips, design ideas, green building strategies, and more insights into the latest trends in decorative concrete. They also link you to articles and other information resources that can help you achieve all your design goals. Sign up for your specific interest or get the whole bundle. You can choose which newsletters you'd like to receive after entering your email in the box at right. Problems? Just send us an email with your request to sarah@concretenetwork.com. 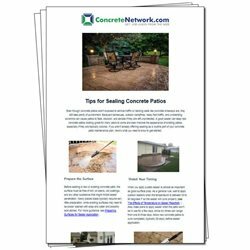 A free monthly newsletter specifically about concrete floors, from new finishing techniques to the latest trends in concrete stains and dyes. Includes technical tips, product news and specials, reviews of new tools and equipment, and project profiles. Ideal for concrete contractors. Delivered to your inbox the 1st Tuesday of the month. A free monthly newsletter all about making, designing and installing concrete countertops. Includes information about new countertop-making products and tools, choosing and applying sealers, technical tips, and project profiles. Ideal for concrete contractors. Delivered to your inbox the 2nd Tuesday of the month. 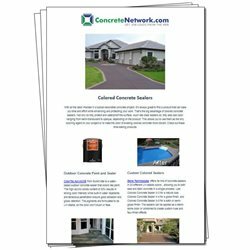 A free monthly newsletter about exterior decorative concrete, including stamped driveways, patios and pool decks, outdoor kitchens, decorative concrete overlays, and more. Get design and installation tips, news about the latest stamping tools and coloring techniques, project profiles, and troubleshooting help. Ideal for concrete contractors. Delivered to your inbox the 3rd Tuesday of the month. 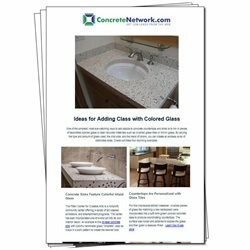 A free monthly newsletter about decorative concrete products for indoor and outdoor applications. Gain a competitive edge by keeping up with the latest technology and the newest and most noteworthy concrete products on the market. Discover new sealers, equipment, cutting-edge innovations and more. Plus get product specials and watch video demonstrations. Ideal for concrete contractors. Delivered to your inbox the 4th Tuesday of the month.